Morphogenesis is the set of processes that generate shape and form in the embryo--an important area within developmental biology. 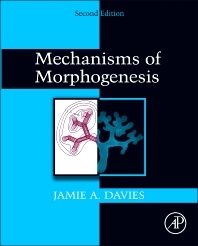 An exciting and up-to-the-minute account of the very latest research into the factors that create biological form, Mechanisms of Morphogenesis, second edition is a text reference on the mechanisms of cell and tissue morphogenesis in a diverse array of organisms, including prokaryotes, animals, plants and fungi. Cell and developmental biologists, graduates, would attend conferences by the British Society for Developmental Biology and the American Society for Developmental Biology, the Developmental Pathology Society etc. How Good a Model is D. Discoideum for other Species? Why Migrate as a Collective? How Conserved is Branching by Sprouting? Reduced Cell Proliferation: an Aid to Boundary Stability? Are Multilayered Morphogenetic Systems Hierarchical? Looking Forwards: What Remains to be Done? Since 1995 Davies has run his own laboratory at the University of Edinburgh, with a multidisciplinary focus on discovering how mammalian organs construct themselves and how we can use apply knowledge to build new tissues and organs for those in need. Some of the work of his 20-strong research team is 'conventional' developmental biology; identifying signals and mechanisms used in natural organ development. Some is bioinformatic analysis (we host the editorial office of an international database for renal development – www.gudmap.org – funded by the USA National Institutes of Health, and the www.guidetopharmacology.org database, an international effort for the International Union of Basic and Clinical Pharmacology). Some of his work is in tissue engineering – his lab has recently developed a method to produce engineered 'fetal kidneys' from simple suspensions of stem cells, an activity that attracted considerable press attention last year. Finally, his lab is pioneering the application of synthetic biology techniques to tissue engineering, to 'program' cells to make structures that are designed rather than evolved. Davies has published around 140 research papers in the field of mammalian development, has published one major specialist monograph (Mechanisms of Morphogenesis, Elsevier, 2005 2nd Ed 2014), one public engagement book (Life Unfoloding, OUP, 2013 (Hardback), 2015 (paperback), now in translation also) and has edited three multi-author books in the fields of development, stem cells and tissue engineering. His contributions to research and teaching in this area have been recognized by having been elected a Fellow of the Royal Society of Biology, a Fellow of the Royal Society of Medicine and a Principal Fellow of the Higher Education Academy. Davies served as Deputy Chair of the National Centre for 3Rs, a government agency that promotes research that refines, reduces or replaces animal experiments. He has also served as Editor-in-Chief of the research journal Organogenesis for 8 years, and is currently an Editor of Journal of Anatomy and PLOS One.